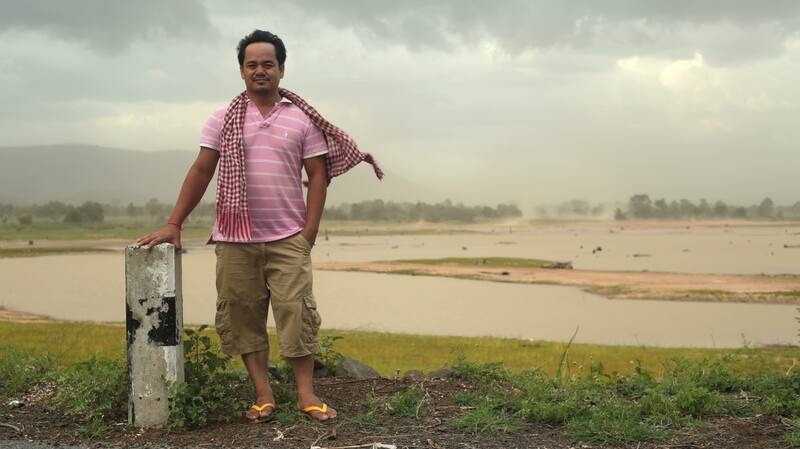 Srey Bandaul at Site II, 2014, Image by Thomas Buttery. Courtesy of Khmer Passages. Srey Bandaul (b. 1973, Battambang, Cambodia) studied with the French artist Veronique Decrop from 1987 until 1991 in an art school she founded at Site 2 Camp on the Thai border. This school moved to Battamabang in 1994 and was established as Phare Ponleu Selpak with Decrop and nine Cambodian artists, including Bandaul. He has taught drawing and painting at Phare since 1995 and is currently Professor and the Director of the Visual Arts School. Bandaul first exhibited his works in 1998 at Reyum Gallery, Phnom Penh Cambodia. Since then he has published two books, Looking At Angkor and The Land of the Elephants and has exhibited in Norway, Philippines, Thailand, Australia, Singapore, New York, London, Istanbul and Myanmar. He is an Asian Cultural Council Fellow. Annie: Could you please tell me more about your background and training as an artist? When did you start doing performance and could you please tell me more about the early memorable ones? Srey: I have been an artist for nearly 20 years. I studied art at the Site II (refugee camp near the Thai border during the Khmer Rouge) with my teacher. It gave me some kind of ideas that caused me to look … and of course, there was personal talent as well. Since then I have been an art teacher, teaching at Phare Ponleu Selpak. I had my first exhibition in 1997, showing drawing from imagination and figurative drawing. Then I began to with conceptual painting, or contemporary painting from 2005. I visited some museums with some exhibitions where they did live performance. At that time it was a bit complicated to me because it was hard to understand. It was difficult and so I didn’t like it, but step by step I tried to understand why they did that. After that, I thought, that’s great, because with performance, you can express more effectively your feelings through your body language, and that was interesting. I did the first performance in 2006 in collaboration with a dancer in the Mekong River Festival. In 2006, the concept was about the Cambodian history, which we discussed a lot. There were three people working on the performance. Me, Abel and one of the contemporary dancers from New York, a Filipino-American. The performance was talking about Cambodian history, especially after the Khmer Rouge, which was not really remembered because it was a long time ago. We did a dance with a mosquito net, a big one, which we hung, and I did a live painting on the mosquito net, and they danced. And we moved inside the mosquito net with the candle. We did it at Sovanna Phum in Phnom Penh, a place for performance, with facilitators from Thailand and from Chiang Mai. At the time, we had about 30 artists from different countries, Laos, Thai, Khmer, Vietnam, Burma, Malaysia… We worked in teams, so I chose a partner, we sat down, thought and figured out the idea. We had different performances – some people performed dance, theatre, and live painting. The second time, I think that I didn’t really like what we were doing, but we just tried anyway. Then we did the performance maybe in 2009 or 2010, with The Hawker’s Song project. We did The Hawker’s Song in Phnom Penh [co-produced by Java Arts]. In the past, people used their mouths to make announcements. Traditionally, people would go to different villages to bring some baskets or products to sell to the communities. They would just go around and say, eh I have this and that to sell. But all of a sudden, it’s been modernised by using the megaphone to record the voice instead of yelling at everyone, they use the megaphone to record it and yell. They have ten videos from Hawker’s Song, to show in Melbourne, Australia; Battambang, and they will show it again in the National Museum in Phnom Penh. I did it in my personal project, Digestion, that made me understand it more. And now I will do it again in Java Café & Gallery, on 11 May, this performance. Annie: In 2014, you made a performance video at Site II, in collaboration with filmmakers Thomas Buttery and Jai Rafferty, who were in Cambodia making the project Khmer Passages. Could you tell us more a little bit about Site II and the experience of making the performance video, Site II? Srey: Site II – though it was not far from Battambang, I had not been for 15-20 years. Site II was the place where I grew up and was taught art and general education. We grew up there with a lot of memorable friends, family or people, who didn’t know each other before then. We were living like a family. But mostly, the old people, especially my parents, would say, okay, we will come back to Cambodia someday. Our country is the best country in the world. You can have the experience of good food, good fruit… Everything is good from Cambodia. We loved Site II because we grew up living in Site II but still thinking, peace is very important. The Cambodian country is very important. It was not only me but most of the people shared the same thinking. When the camp was closed and we had to return to Cambodia, we were very happy but we were also sad because our friends were gone one by one, repatriated, but we didn’t know where they went. At the time there was no communication, maybe except by writing letters. Before I arrived in Cambodia, I think, okay we have this, and we are happy. Even if we are sad because we lost friends, we don’t know where are our friends, we have peace, maybe we have good food, good everything. When we arrived in Cambodia, year by year, it feels we have safety, we have good things. I asked them many questions. My parents were very young and now are old people… maybe they don’t like it and what they wish is different, their thinking was different. So step by step, I think I really want to go back to Site II again. I want to show what I thinking when I am in the refugee camp. We got some budget from Iola Lenzi [curator of The Roving Eye; Contemporary Art from Southeast Asia at ARTER] for the exhibition in Turkey so we could travel to Site II. I brought the sarong and mosquito nets to the lake where people used to hang out, do washing or sit down to see the sunset or sunrise. The materials were very important to my life because many families didn’t have money and we didn’t have enough blankets as well. So I used the sarong as a blanket when I slept, and I wore it to sleep. I remember the mosquito net. Everyone used the mosquito net, every family, especially my family when I was young. We slept in the same mosquito net, five, six, seven people, we slept in the same net. In the morning my mum opens it. There are a few pieces, the kroma, sarong and mosquito net, that is really close to me, and to everyone. So for me, they represent a witness. If you compare now, the rich people don’t wear the sarong or the kroma anymore, they don’t sleep in the mosquito net anymore. I pulled these materials across the landscape and water, and then put them in the box. I think our adventures and journeys in life is not finished. I believe we came back to the country, the best country that my parents told me about, and everyone had talked about, Now I think that we bring our experiences of a long time to the box. Annie: Could you please you tell me more about the performance at Java Café & Gallery, in May 2016? Srey: The performance has four or five people that will sit at a table. The title of the performance is ‘Evening snacks: near the statue of the King Father,” because in the park near the Java Café & Gallery, they have a memorial statue of the King Father. On the table we have some beer and some snacks – this is the real situation of the real Cambodian people where everyone drinks beer. And we have a discussion where I talk about why I chose this title, because I think the King Father is the main person in the common political society. He’s the one that is really important. For the performance, I sign on the trigger bullet case. Just as he used the fountain pen to sign, I do it. Then I will use this sarong to wrap my body during the discussion. And to close the performance, I put sarong inside the second more bullet case. The discussion we have is about two things: one is the art and colonial cultures, because we are talking about Cambodian art that is influenced by colonial culture. But I am talking about the positive aspect – we get inspired by art from the west. And then the next discussion is whether young Cambodians practice modern and contemporary art, that is actually colonial art. I will open the dialogue, and then during the discussion I will wrap myself in the sarong. The discussion will take place at the same time. Then after wrapping my whole body, I will take it [the sarong] out again, and then I will just walk to somewhere and come back, say thank you, and that the performance has finished. For me, because when I have discussions about art, they say, oh but you’re so brave. The common people, they don’t want to say that modern or contemporary art is from colonial culture, and influenced from the West. I think I’m not brave, because I am an art teacher, and now, a professional. When I am critiquing art history, I do a lot of research, so I get some ideas to discuss, to share with the people. Some people say, you are not right. I say, okay, let’s have a discussion. Annie: The issue of colonial influence on contemporary art was also raised during a conference in 2013 in Siem Reap, where it caused some heated debate amongst artists. Your show at Java Café & Gallery is titled “I Want to Get Married”, what does that mean? Srey: To me, you have to have your own voice or your own identity. It’s not only in art, culture and technology, where you can be inspired by other countries and other cultures. But you cannot do it again, even if you look back to Angkor or you look back to the Mesopotamia, or all the advanced cultures/civilisations. To be inspired by the ‘Other’. Cambodian people sometimes describe something that looks like Nationalism. Khmer is powerful, Khmer is good, but other cultures, other nations are not good like them. Everyone has to be open to the discussion, to the conversation, which is very important. You can learn, you can get some ideas from others. The drawings I copied [for the show] are from masterpieces of the really famous artists like Van Gogh, Duchamp, Dali, Picasso, Gauguin and Claude Monet, to raise the issues, or the problems in Cambodia. The title of the show is, “I Want to Get Married”. I put many personal details, like people who were killed by someone, or people working with human rights or the forests. I put them in the pictures. If you know that history, maybe you will recognise it. But if you don’t know, maybe you won’t. I’m talking about the situation in Cambodia. It’s like a union between many bodies and key players. It addresses the social issues of Cambodia, the issue of differentiation or injustice that many people face. A lot of people get killed but the perpetrators are not punished. I never saw any key players, any associates to come and join forces to talk and tackle the problem. So to ‘get married’, which means a unification between the two – come and discuss the issues and problems, to be into this idea of harmony. Annie: How do you think you have developed your approach to performance between Site II and ‘Evening snacks: near the statue of the King Father”? Srey: Site II is a performance piece. It’s not ‘performing arts’ as you don’t need a specific audience, you just use the whole body as an expression to formulate the concept. One starting point is what kind of message I want to send to the audience or to the viewers? Online, offline? How can I do that, how can I realise my concept? The one I will do in Java Café & Gallery is ‘performance art’ as well, not a ‘performing art’. I try to clarify what is ‘performing arts’ and what is ‘performance’. I asked the questions maybe two or three years ago when in the conference organised, they were talking about performance. I asked the question because sometimes they say ‘performing’, sometimes they say ‘performance’, so I asked could you explain very clearly what is ‘performing’ and what is ‘performance’. Because in Khmer, we don’t hear that word. For example, live painting for me, it’s a kind of performance, because they create the idea and they show it to the people, in the sense they sometimes do it on the street or where they want to do. For me, I am a little bit shy because I am not a real performer. But by doing Site II, I became more confident, because to me there were only two people shooting in a quiet place with no other people. Here, a lot of public will come to see it. But I think performance may be more effective, so I learn to work with them, or with this kind of art, and maybe try to develop more and more in the future. I think we need more performance in Cambodia. But unfortunately most of the performances, we need money, we need a budget to build or to boost the show/ performance. And now only some associations like Phare Selpak Ponleu, where we have the circus and dance do that. So for me, we need more but I don’t know how to do that. I think a lot of the performances I do are very conceptual, so I think they might not understand. But for this, we can try to sell to the people even if they’re not interested. But maybe year by year, step by step, they might become interested. So we need to push, but I don’t know how we can push it. In Battambang, I proposed ‘live painting, I think. I was inspired from when I visited Thailand, I forget the year. We saw one live painting by a very famous artist in 2004. We visited him, and I think that’s good, so I came back and proposed it to my students to do. I love installation and performance. The drawing and the painting, when I love it so much, but maybe less than the emotion, less than installation and performance. I do what I can. I can use my body language to do it, and maybe some material to support. For my performance I do not need a lot of technical aspects, for me I need only the concept. If I found a good concept, then I can do it myself. There’s no need for training. But for performance in Cambodia, there’s a lack of deepness. There’s a lack of message, either verbal or non-verbal message, but they only show talent and energy, for example for the circus. But the performance has no concept in it that could be useful or otherwise beneficial for the audience afterward the show. Annie: Why do you think performance is important in Cambodia? Maybe two months ago, I met up with one guy who was working in the art career but he’s not an artist. He taught at Site II. He was a student at RUFA [Royal University of Fine Arts in Phnom Penh] before the Khmer Rouge. He was also a soldier. You can say, he’s a producer. He makes some portraits for the kings and for the government. He didn’t know I’m an artist. He opened the shop in Battambang, and he made a lot of paintings about Cambodian landscape for sale. So for the opening, he invited all the people, and especially his students – I used to be his student – and most of the people who went to study one or two months with him. We all sat down and talked about contemporary art, and they say, to the people who make contemporary art that they don’t know how to draw and paint. I talked to him, I said I think you’re right, but I want to give you some idea why people do that. And after talking, he said he understood. Then I asked him to participate in my performance and he said, okay, please let me know. And two weeks ago, I called him and he said, oh no I could not participate. I want to get the people who were involved in painting and drawing but never traveled abroad, who don’t understand contemporary art or modern art, who just do figurative portraits. And I really needed the really young generation who are doing art, they have experience but they are very young. And then I need more people, the older people who were involved in contemporary art. Then I think this would become a real discussion, and why we can explain after we get the understanding, that it’s not just performance, but also like an education to the people. This was inspired from when I participated in the art residency in Yangon, last year, where there were different performances and installations. I did an installation, and a Vietnamese artist Dinh Q. Le did the performance called the Last Dinner. They invited around ten people from different media, people who were generals, soldiers, or governors come and discuss the character of Aung San Suu Kyi. There was a real discussion for around two hours. That’s really important. I think we need more sharing of ideas. Maybe every year we should have one or two conferences, invite practitioners to have discussion and sharing, and create performance together. Only thing is this needs some sponsors, need some money. However in order to change a country, especially the perception or the viewpoint of the population they need to perform this quality of performance. The message can be sent to them and at the same time possibly provoke some institutions, such as Ministry of Education, Ministry of Culture, so that it could change their perception toward what is contemporary art. And once everybody changes their mind toward this culture, then, of course, it’s going to be a contribution to develop Cambodian contemporary art. Because artists, they’re not politicians, they don’t have powerful voices, but this is the voice they can use to play a change a perception of the public.